We were thrilled when Dan Ariely agreed to our interview. For us, as corporate comms trainers and creators of ‘business-writing’ software, his books are some of our ‘bibles’. Those, his TED talks, and even his game are fascinating, because, well, human behaviour is fascinating. Become a better psychologist, and you become a better communicator, leader, follower, parent and person. His theme is irrationality: You’re nowhere near as rational as you like to think. 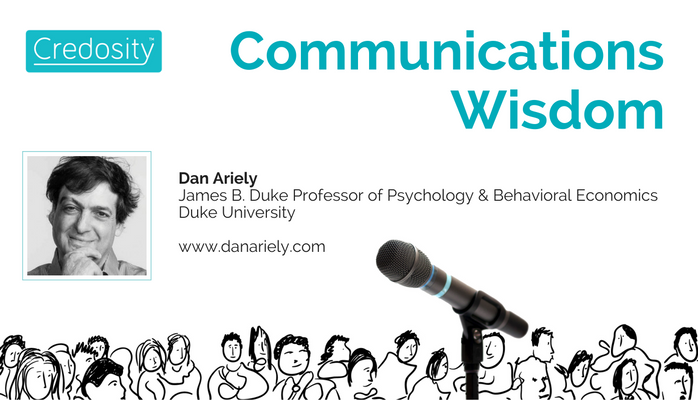 So how does a guru of behavioural economics view communication? Does having a deep understanding of irrationality change how you should connect, engage and persuade people? The answer is YES. To hear how, watch this video (mainly audio). It’s only 15 minutes long. Or you could read the transcript included. But it’s much nicer to hear Dan’s intonations as he speaks.